On March 30, Wilmington College and Southern State Community College co-hosted the state of Ohio’s District 17 Science Day at Southern State’s campus in Hillsboro. This marked the 14th year of Wilmington’s involvement with this prestigious event and the third year that it took place at Southern State. Participants included 55 high school, middle school and elementary students primarily from Highland, Adams and Brown counties who had received superior ratings at their local science fairs in order to qualify for the District Science Day. On Saturday, March 30, these students converged on Southern State where they presented their research projects. Dr. Russell Kincaid, the Science Day coordinator, was pleased with the excellent work done by students within the district. Thirty-four students from the event qualified for state science day by receiving superior ratings. The students presented research on projects which covered a wide range of topics including agriculture, biotechnology, energy, environmental sciences, information science and technology, botany and material science, among others. Students represented 14 schools within Ohio’s 17th District, including Georgetown Junior/Senior High School, Fairfield Middle School, Ripley-Union-Lewis-Huntington (RULH) Middle School, Hamersville Elementary School, Mt. Orab Middle School, Fayetteville-Perry Elementary School and Middle School, North Adams Elementary School, Peebles Elementary and High School, Sardinia Elementary School, Russellville Elementary School, West Union Elementary and St. Michael’s School in Ripley. In addition, students from other districts whose schedules had conflicted with their assigned District Science Day were guests of District 17 on March 30. These included students from Oakwood High School and Ridgewood School. Eleven students won scholarships to the BWiser Summer Science Camp at the College of Wooster. Those students included Ainsley Beckler, Caprice Cordes, Emily Bertram, Riley Bertram, Evelyn Cahall, Allison Kratzer and Kaylee Helbling from Brown County, as well as Izzy Scott, Elizabeth Gerth, Caydence Carroll and Gracelynn Seaman from Adams County. Special awards were given, which included scholarships and cash prizes. The Ohio Soybean Council awarded a cash prize to Colby Barber of Fayetteville-Perry Middle School. The Southwest Ohio Water Environment Association (SWOWEA) awarded cash prizes to three individuals judged to have the best environmental projects. Vanessa Trotter of Peebles High School received first place, Rylie Cahall from Sardinia Elementary School received second place and Robbie McClellan from North Adams Elementary School received third place. The Ohio Tuition Trust Authority (OTTA) provided a scholarship for Xander Beam of North Adams Elementary school and Hannah Griffith of Mt. Orab Middle School. In addition, Kaya Mitchell of Fayetteville-Perry Middle School and Gracie Blackburn of St. Michael School in Ripley were designated as alternates for the OTTA scholarships in the event the other students do not claim their award. From Highland County, Fairfield Middle School sent three teams to Southern State for the event. 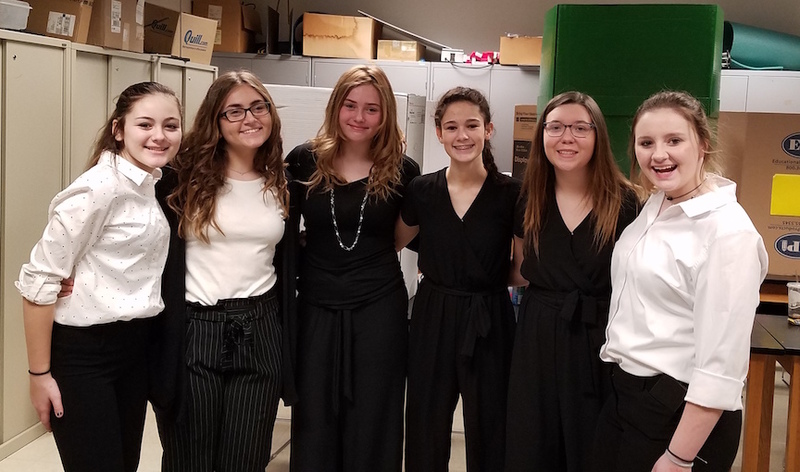 Faith Miller and Peyton Magee, Paris Priest and Mikalah Sheridan and Madison Giles and Elizabeth Huston were the three teams, and the teams of Miller and Magee and Priest and Sheridan qualified for the state competition. Numerous judges, including Southern State faculty, Wilmington College and Southern State students and members of the community, gave their time to make this event possible. The time and efforts of all these individuals, as well as the students, teachers and parents, made this event a success.